The tenuous excuse for including the Reverend Horatio Bolton in these pages is that he was one of the more interesting people present at the 1851 Caistor Chess meeting, the first such chess event run Arthur Bolland Skipworth, who later did significant things while resident in Yorkshire in Yorkshire. The Rev. Horatio Bolton was descended from an East Anglian family which contained a number of clergymen. His great-great-grandfather was a surgeon called Samuel Bolton. This Samuel Bolton had a son, (Rev.) Thomas Bolton, born 1696/97 at Woodbridge, Suffolk. This (Rev.) Thomas Bolton went to St John’s College, Cambridge (BA 1718/19, MA 1722), was ordained as a deacon at Norwich in June 1870, becoming a priest in June 1871. He was rector of Hollesley, Suffolk, about 7 miles SE of Woodbridge, which is about 8 miles ENE of Ipswich, and rector of Barham, a “scattered village” [Bartholomew’s Gazetteer of the Br. Isles] five miles north of Ipswich, in 1731. He died 10/01/1772, at Ipswich. This Rev. Thomas Bolton had at least two sons. One son of the above Rev. Thomas Bolton was another (Rev.) Thomas Bolton (born 15/09/1736 at Coddingham), who followed his father to St John’s, Cambridge (BA 1760), and like his father became ordained (deacon, London, 01/06/1760; priest, Norwich, 18/12/1763). He was rector of Nedging, Suffolk, 1763, then perpetual curate of Mary-at-Quay, Ipswich, 1764, then succeeded his father as rector of Hollesley from 1772 to 1783. He died 29/12/1821, at Glebe House, Nedging, having married three times. Another son of Rev. Thomas Bolton, senior, was Samuel Bolton of Coddingham, Suffolk, near to Barham. This Samuel Bolton had at least two sons, (Rev.) William Bolton, and Thomas Bolton of Wells. William Bolton was baptised on 17/04/1753, at Coddingham. He went to Trinity College, Cambridge (BA 1775, MA 1780), going on to be ordained (deacon 14/12/1777; priest, Norwich, 19/09/1799). He became curate of St. Mary Key, Ipswich, 1777, vicar of Holkham with Egmere, Norfolk, 1780-83; succeeded his uncle as the third successive Bolton to be rector of Hollesley, 1783-1829; also rector of Brancaster, Norfolk, 1804-40 (Robson's Commercial Directory of Beds, Bucks &c, 1839, list him as such). On 12/12/1776 he married Mary Woodthorpe, daughter of William Woodthorpe of Little Oakley, Essex. This couple were the parents of Horatio Bolton, the chess-player. The other son of Samuel Bolton of Coddingham, Horatio Bolton’s grandfather, was Thomas Bolton of Wells, Norfolk, he being Horatio Bolton’s uncle. This Thomas Bolton married into another family of East Anglian clergymen, the Nelson family, marrying a daughter of the Reverend Edmund Nelson (born 19/03/1722, died 26/04/1802), the rector of Burnham, Norfolk. The Reverend Edmund Nelson had married Catherine Suckling (born 09/03/1725, died 26/12/1767), daughter of Maurice Suckling, prebendary of Westminster. The couple had eleven children of whom one was Horatio Nelson, known as “Horace” within the family it seems, who went on the be an admiral, and became famous for dying at the Battle of Trafalgar. Catherine Bolton died when Horatio Nelson was only nine. Admiral Horatio Nelson was thus a brother of the wife of the brother of the father of the chess-player called Horatio Bolton. Horatio Nelson was reputedly the godfather of Horatio Bolton, and so Horatio Bolton was presumably named “Horatio” after Horatio Nelson. However, the name Horatio can be traced a step further back. Catherine Bolton was great-niece to Robert Walpole, and cousin to Horatio, second Lord Walpole. This Horatio Walpole was godfather to Horatio Nelson, who was thus presumably named “Horatio” after his godfather. Thus, indirectly, Horatio Bolton appears to have been named “Horatio” after Horatio, second Lord Walpole. Horatio Bolton was born at Hollesley, Suffolk, son of William Bolton, rector of Hollesley, and Mary Bolton, née Woodthorpe. He was baptised on 02/06/1793, at Hollesley. After attending the schools of Mr. Haggitt, at Dedham, Essex, and of Mr. Girdlestone of Beccles, eight miles west of Lowestoft, he went to Caius College, Cambridge (BA 1818, MA 1823), becoming ordained (deacon, Norwich, 27/06/1819; priest 17/06/1821). “Mr. Haggitt” [Venn] would presumably be Rev. John Haggitt (1804-1828) who Venn infers was a master at Dedham school. “Mr. Girdlestone” [Venn] would presumably be Rev. John Lang Girdlestone (1756–1825) of Beccles, who Venn gives as schoolmaster at Beccles 1794-1813. The Rev. Horatio Bolton was vicar of St. Mary’s, Docking, Norfolk, about five miles south of Brancaster, from 1829, when he succeeded the Rev. Robert Bathurst after the latter’s death, holding that post to his own death in 1873, and he was rector of St. Edmund’s, in the parish of Oby, Ashby and Thurne [Venn uses the alternative “Thirne”, but White, Bartholomew and OS call it Thurne; White gives the two as alternatives], 1829-73. The parish is about eleven miles NW of Great Yarmouth, Norfolk, hence he was often described as coming from Yarmouth. It’s difficult to see he could adequately serve both Docking and Oby, in view of their distance apart. Pigot's Directory of Norfolk, 1839, affords some light, as it states the living of Docking was both a vicarage and a rectorage; Rev. Horatio Bolton was the vicar, while Rev. Humphrey John Hare was rector, who was the only one of the two resident at Docking. Pigot doesn’t seem to mention our man in any other context. Craven & Co.'s Commercial Directory of Norfolk, 1856, lists Rev. Horatio Bolton, MA, as vicar, and Rev. John Wilson, MA, as curate. Presumably conducting the advertised services at 11 a.m. and 3 p.m. fell to the curate. Rev. Horatio Bolton, MA, is listed as rector at Thurne (location of the parish church); as no other cleric is listed, it must have fallen to Horatio to conduct services, again at 11 a.m. and 3 p.m. He married Elizabeth Mary Blyth (Venn’s “Bligh” is wrong), born 1802/03 at North Creake, near Burnham, Norfolk, daughter of Henry Blyth of Burnham, Norfolk, on 13/11/1832. They appear to have had no children. Censuses indicate that he and his wife lived at Oby rectory from 1851 or before to 1861 or so, and seemingly from 1841 or before though the term “rectory” wasn’t mentioned on the 1841 census form. The 1871 census found the couple at Foundry Road, Norwich. Throughout, they are shown with three or even four (1841) servants. Described as rector of Oby, Norfolk, he was a subscriber to "An analytical comment on the first part of the Revelation; being an attempt to elucidate both the historic and prophetic sense of the Epistles to the Seven Churches of Asia" by Henry Girdlestone, AB, Rector of Colton, Norfolk, who was presumably his old schoolmaster or a relative of same. Horatio Bolton died on 15/08/1873 at “7 Thorpe Hamlet” [according to probate record], Norwich. Thorpe Hamlet is now a district on the east side of Norwich. He was buried 21/08/1873, at Burnham Deepdale, Norfolk, two miles or so west of Burnham and two miles east of Brancaster. His will with three codicils was proved by Henry Etheridge Blyth of Burnham Westgate, Norfolk, and Fredrick Branton Blyth of 53 Lincoln’s-Inn-Fields, Middlesex, which supports the idea that he’d had no children, these two executors being members of his wife’s family. His effects fell in the “under £14,000” bracket. Harrod & Co.'s Directory of Norfolk & Lowestoft, 1877, listed the Rev. William Cufaude Davie as incumbent at St. Edmunds, Thurne. It’s amusing to imagine him finding unpublished Bolton chess problems stashed away in the rectory, and burning them on the garden bonfire. He attended the 1851 chess meeting at Caistor, one imagines by specific invitation, but wasn’t generally noticeable as a chess-player as such. What he was noted for was his abilities as a composer of chess problems. After Bolton’s death, the chess column by Staunton in the Illustrated London News of 20/09/1873 described him as "one of the finest composers of chess problems this country has produced". MY DEAR MR. STAUNTON, - It was at your request that I first became a contributor to the Chess Player’s Chronicle, a connection which has for many years afforded me great delight. If by any of my problems I have added to its interest, to you belongs the praise; and now that I would withdraw from the chequered field, and leave the bloodless contest to more useful aspirants, I would beg the favour of you to permit me to dedicate my last effort to you, as a mark of sincere esteem and admiration. By this connection with your name, it is truly gratifying to me to reflect that I shall be remembered in the Chronicle, not only as a contributor to its pages, but as the friend of the Champion of England. Oby Rectory, June 18th, 1850. Dedicated to H. STAUNTON Esq., by the Rev. H. BOLTON. 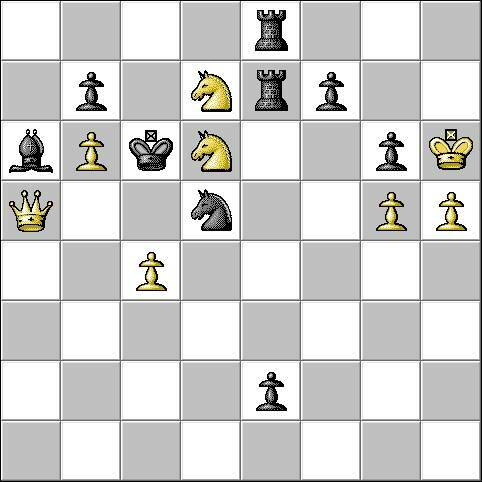 White playing first, to Mate in twenty-four moves. It would appear that the Rev. Bolton supplied to Staunton some manuscripts containing as yet unpublished problems. The following are selected for being contemporary in publication date with the 1851 Caistor chess meeting. The Chess Player’s Chronicle 1851, page 192, printed the following, introduced by the note “This fine stratagem is from the unpublished MSS. of the REV. 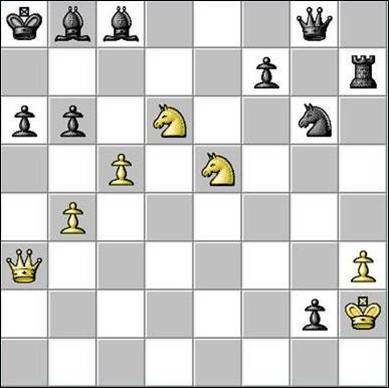 H. BOLTON.” It’s one of those self-solving positions, and humorously illustrates two knights working together, though there’s a price to pay to get them going. 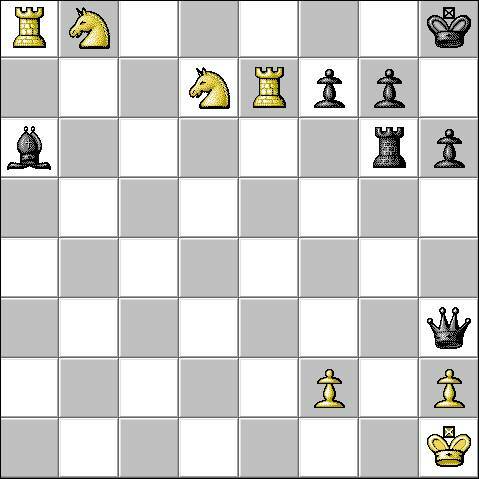 White playing first, mates in twelve moves. The following from the Chess Player’s Chronicle 1851, page 95, has the introduction “Amusing little stratagem, hitherto unpublished, from stray leaves of the Rev. H. Bolton’s.” It involves something we all want to do, justifiably, in an actual game. Again it is easy to solve. 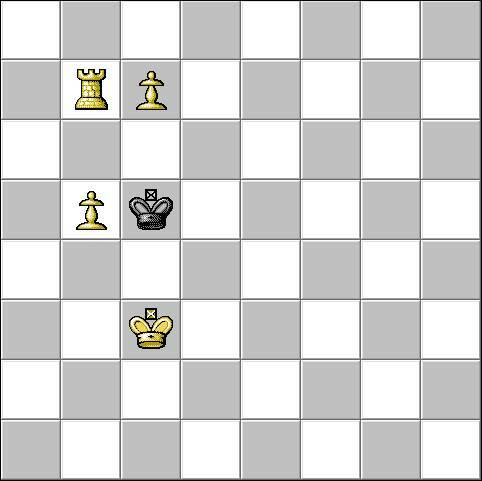 White to move, and checkmate in eight moves. A pair of white knights seems to have been a fairly commonly recurrent feature of Bolton’s problems. and as stated in the text.